Picture the scene. You’re at one of your favourite trendy Sheffield restaurants, your food has just arrived and you’ve whipped out the iPhone to flex for the Gram. A standard night out, right? Imagine this. If you’re Insta post gets more than, for example, 50 likes, you can claim a free bottle of wine the next time you visit that restaurant? Sounds spot on, doesn’t it? 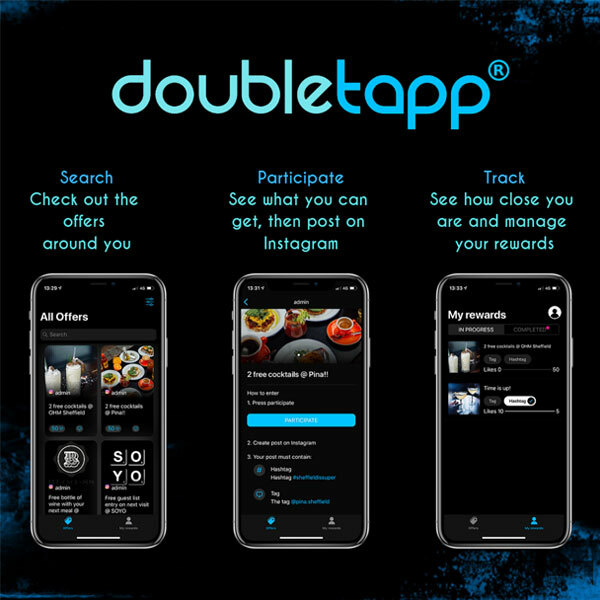 That’s where Ashley Staines and the DoubleTapp app come in. It’s a win-win situation, especially with a bunch of Sheffield restaurants on West Street, Ecclesall Road and Kelham Island already signed up to the app. “We’re looking at launching in late-March, we’re going to ramp it up with flyering, paid ads on Instagram and influencers getting the word out. The man behind the app, Ashley Staines, is familiar with the Sheffield food scene and, since leaving the city a few years back, has watched the food scene grow from afar. “I graduated from Sheffield University in 2013 and spent six years as an investment banker at Goldman Sachs but I’d had enough. I wanted to make something, it didn’t matter what. I love the idea of people loving something I’ve come up with. When the app launches on Friday 22 March, punters can sign up and claim a free bottle of prosecco at Honeycomb or two free cocktails at Pina and OHM. FULL LIST OF VENUES CONFIRMED – MORE TO FOLLOW!